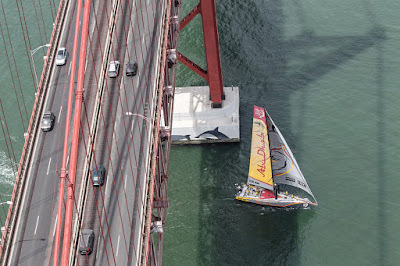 Ian Walker (GBR) and his seven Abu Dhabi Ocean Racing crewmates left Lisbon for the 647-nautical mile (nm) Leg 8 to Lorient on Sunday with their eyes glued on the weather forecast - and the progress of their two closest rivals. The penultimate stage is the shortest of the nine-month race by some way, but no less challenging for that. 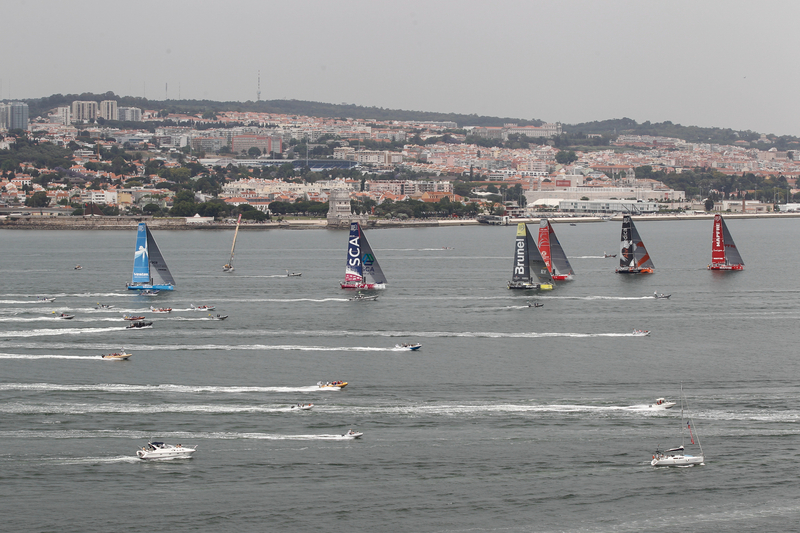 The fleet, restored to seven boats again after the return of Team Vestas Wind (Chris Nicholson/AUS) in Lisbon following the rebuild from the collision with a reef in Leg 2, should take three to four days to reach Lorient on the Brittany coast. In-form MAPFRE made the early pace on Sunday at the leg departure (1400 local time/1300 UTC) as the fleet attempted to deal with the tough, near windless conditions, as well as the iconic iron bridge which straddles the tidal Tagus River. Abu Dhabi Ocean Racing was struggling at the back of the pack (see panel above) in seventh place early on, but it was still very early, even in such a short stage. 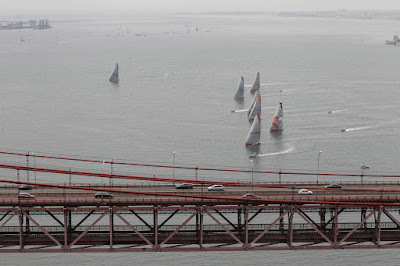 The race is intriguingly poised with Abu Dhabi Ocean Racing, on paper, able to clinch overall victory if results go their way when the boats arrive after around four days of sailing. Should they win, and their closest rivals, Team Brunel (Bouwe Bekking/NED) and Dongfeng Race Team (Charles Caudrelier/FRA) finish fourth or worse, then Walker can loft the trophy in France. However, he brushed aside all premature talk of that prospect at the pre-leg press conference on Friday. “There’s a lot of this race left. In offshore sailing, you can lose it going up a river at the end,” he said. “I’ve seen Admiral’s Cups lost in the dying seconds. We’re a long, long way from winning this race. When you start to think you’ve got it won, that’s when you start to lose. 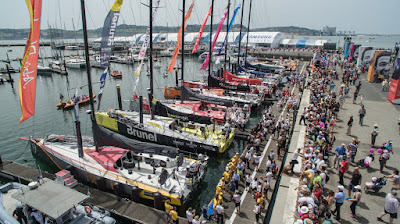 It is not just Team Brunel and Dongfeng Race Team who will want to upset Walker’s bid to claim the trophy prematurely in Lorient. 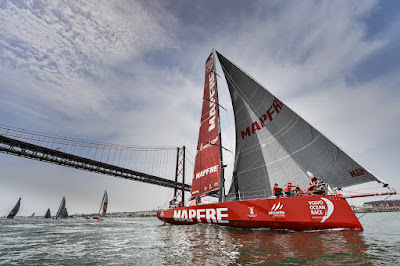 MAPFRE (Xabi Fernández/ESP) are currently in red-hot form. 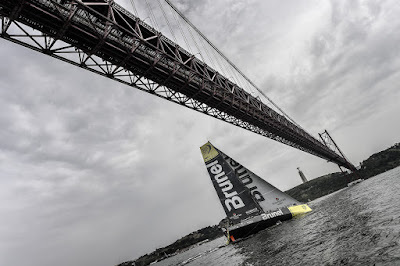 They were narrowly pipped by Team Brunel into Lisbon at the end of Leg 7, but bounced back with a paper-thin, in-port race victory here on Saturday at the expense of Walker’s Emirati boat. 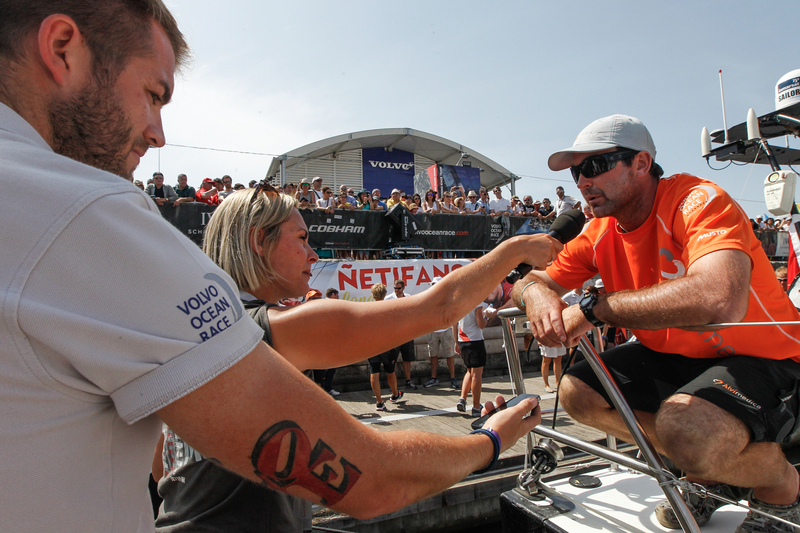 Their cause is boosted by a desire to underline their credentials as one of the classiest crews in the fleet, after two separate brushes with the independent, international jury following rule breaches cost them a total of three points. Similarly, Team Alvimedica (Charlie Enright/USA) are improving leg on leg, and have garnered two podium places in the last 10 days: third in Leg 7 and the same position in the in-port race. 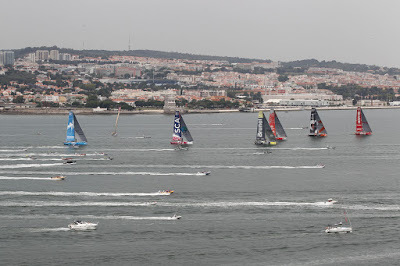 They spent much of their pre-race build-up based in Lisbon, training in the Tagus River and nearby Cascais and were hoping to make that local know-how pay in the early stages of the leg. Team Vestas Wind are simply delighted to be back in the mix again, after climbing their own Everest simply to repair their shattered boat in time to re-join the fleet for the final two legs. 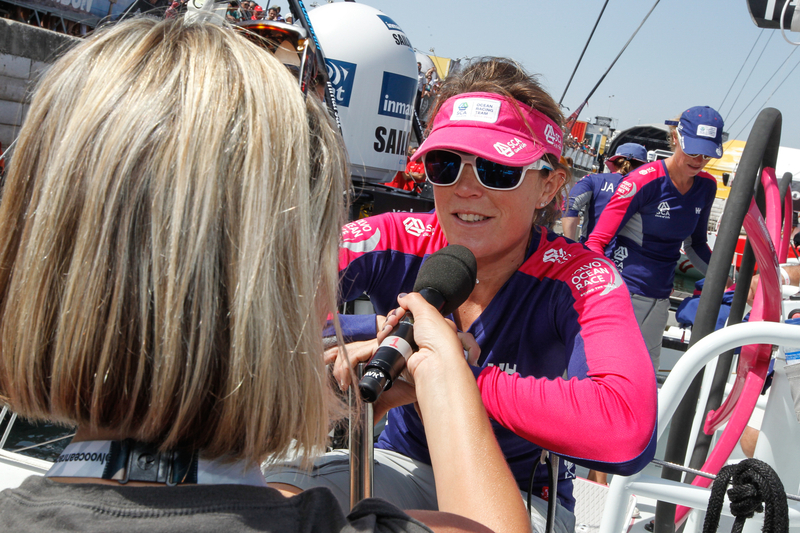 Team SCA (Sam Davies/GBR) know that the last two, sprint, coastal legs – the ‘European Tour’ – offer them their best chance of upsetting the established order of dominance. They too have improved leg after leg, but that progress has yet to be rewarded on the scoreboard. Davies, whose home is near Lorient, would love nothing better than to claim their best results at the climax of the 12th edition. 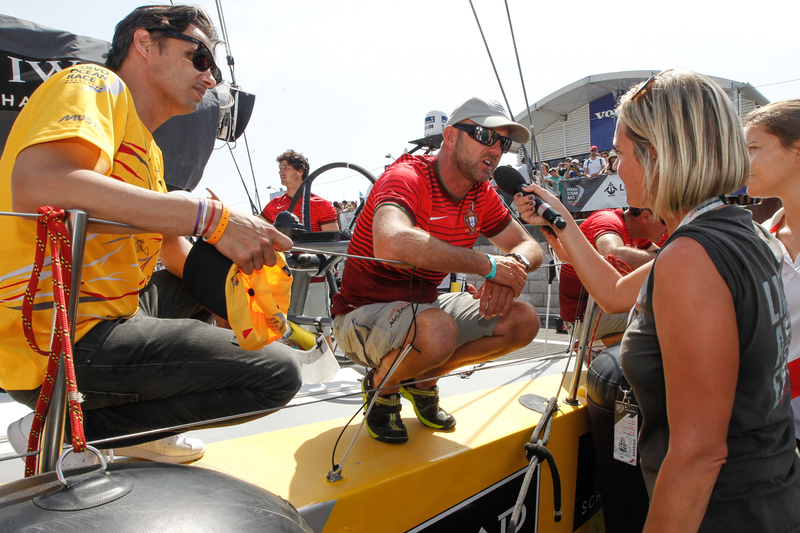 “It’s a shorter leg, a sprint, which is a little bit different. We know that we can stay with the group – we’ve been in the lead after three or four days in other legs,” she said in a pre-leg interview. 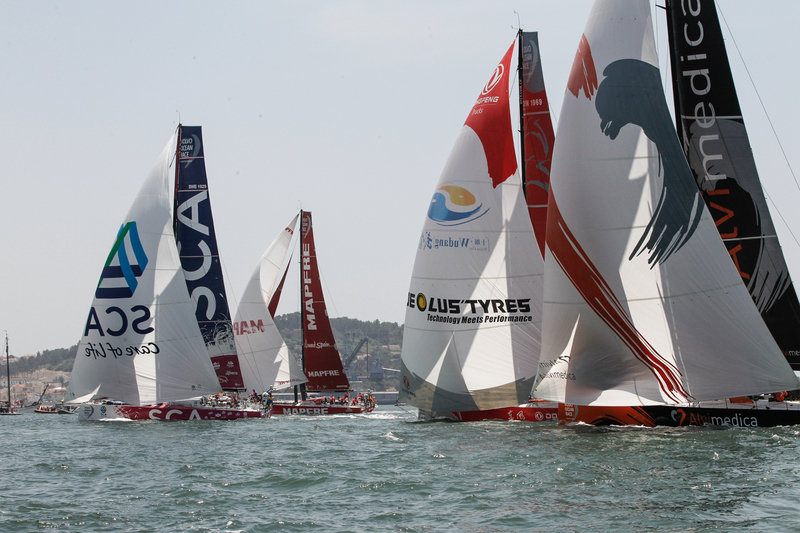 The event finishes with an in-port race in Gothenburg on June 27. 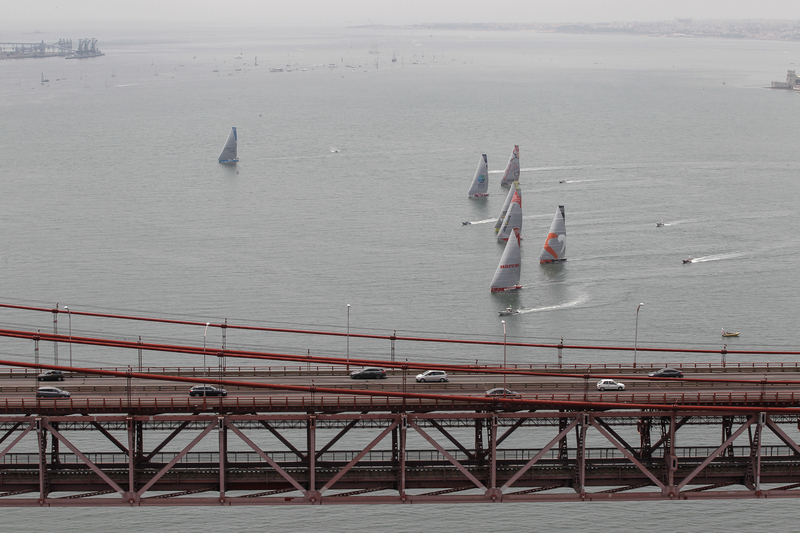 In all, the boats will have covered 38,739nm and visited 11 cities and every continent. 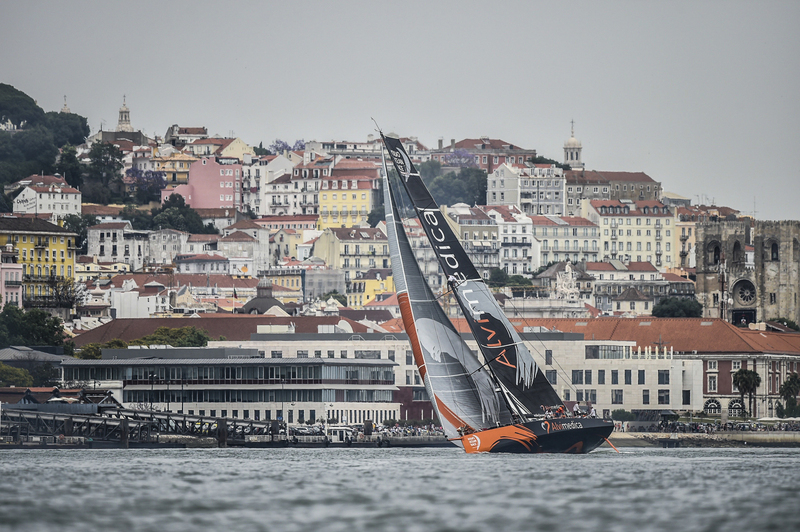 Current latest standings (low points wins, In-Port Race Series splits ties): 1) Abu Dhabi Ocean Racing 16 pts, 2) Team Brunel (Netherlands) 22, 3) Dongfeng Race Team (China) 22, 4) Team Alvimedica (Turkey/U.S.) 27, 5) MAPFRE (Spain) 27, 6) Team SCA (Sweden) 43, 7) Team Vestas Wind (Denmark) 52.